Despite a poor performance in 2013, analysts are more sanguine about the prospects for Russian stocks in 2014. Russian equity had one of its worst years on record in 2013, especially compared to the champagne year in U.S. and European markets. Yet analysts are more sanguine about the prospects for Russian stocks in 2014. 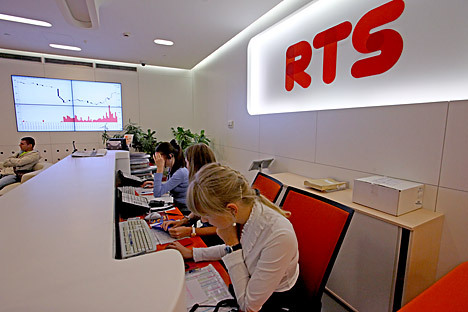 Despite the country’s image problems abroad, including concerns over minority shareholders’ rights and state influence in the marketplace, Russian equities have frequently been among the best-performing in the world in the years since they came into existence. After the Russian stock market was founded in 1995, Russian stocks returned at least 8 percent during 13 out of the past 18 years, and generally returned over 20 percent in any year where there wasn’t a crisis. The real trouble is that those crises tended to destroy most of the previous gains. In both the crashes of 1998 and 2008, the market lost some 75 percent of its value in a matter of months. So what about this year? In 2014, analysts predict the dollar-denominated RTS Index will rise to 1,500, according to a poll of 11 analysts conducted by Reuters. That indicates an increase of approximately 8 percent relative to the year’s open at 1,390. That is perhaps not spectacular. But it is no crisis, and it would represent a recovery from the 5.6 percent loss in 2013. Russian stocks have frequently outperformed their emerging-market peers. From 2000 to 2010, Russia-dedicated funds were the best performing in the world of any asset class, taking spots 1, 2, 3, 4 and 6 out of the top 10, according to fund rating agency Morningstar. The best-performing professional investor fund was Prosperity Capital Management’s Quest Fund, which produced a return of over 3,600 percent in this period, while the best-performing retail fund was East Capital’s Russia Fund, which rose more than 1,500 percent over the same period. The year just ended was one of Russia’s worst on record in which an outright crisis did not occur. The almost universal prediction for 3.5 percent growth in 2013 made at the start of the year failed to materialize. Instead, the economy sputtered, eventually finishing 2013 with about 1.5 percent growth. Economists believe 2013 became Russia’s annus horribilis due to a combination of the soggy global recovery with the collapse of confidence inside the country, which hurt investment in particular. However, simply because 2014 is starting from such a low base, many of them expect the new year to be a lot better than the last and for Russian stocks to rise, partly because they are cheap – even by Russia’s historically low standards. At the end of 2013, Russian shares were trading at a 25 percent discount to their emerging-market peers, an improvement over the 50 percent discount shares were marked down to in 2009. As the year began, Russian stocks had the cheapest valuations among 21 emerging-market economies monitored by Bloomberg, with shares on the benchmark trading at 4.5 times projected 12-month earnings, compared with a multiple of 10.4 for the wider benchmark MSCI Emerging Markets Index. One event that spurred cautious optimism was the reopening of the IPO market in 2013. A total of $7.9 billion was raised via a combination of five IPOs and four Secondary Public Offerings. The biggest factor that could affect the markets in 2014, say economists, would be a return of confidence and the resumption of domestic investment, one of the main economic drivers this year.